15 Free Ways To Boost Your Mood - Welcome to SarahKesseli.com! I used to turn to food to boost my mood. At least temporarily. 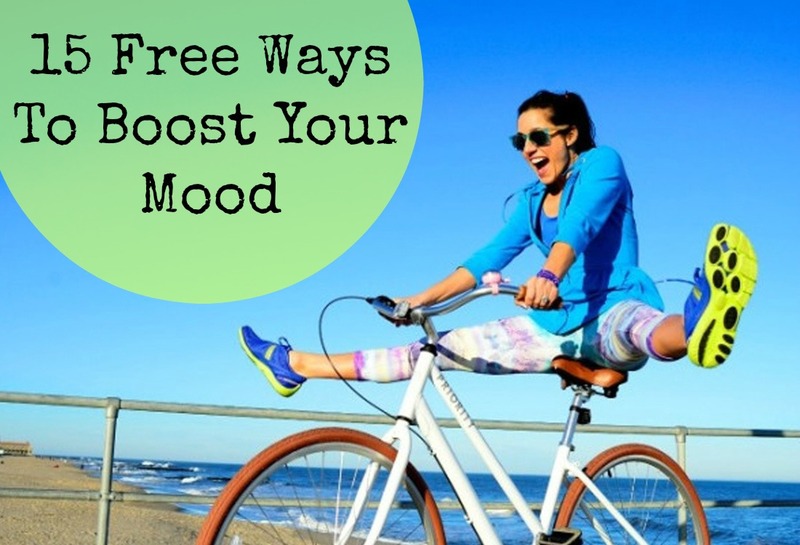 But, over the years I have found other free ways to boost your mood. Give one fo these fifteen ideas a try! I guarantee they will make you feel happier than any box of chocolate will! 1. Head to the beach. Or some place where you can roll out a blanket under the warm sun and relax. 3. Go for a bike ride. Nothing increases endorphins more than a bit of movement. 4. Turn up the music and sing! Do it in your car or your house! Put on your favorite song and just let it go! 5. Watch a funny movie. I mean a funny movie! One that will give you a really good belly laugh! 6. Get creative! Color, draw, scrapbook, sew; anything that will let you express your emotions. 7. Volunteer. There is no better feeling in the world than helping those less fortunate. Do a bit of research and find something in your local area that you are passionate about. 8. Hug someone. A simple hug can do wonders for your mood. It is an easy way to feel loved. 9. Do yoga. You don’t need a fancy yoga studio membership to get your chi on! Give one of these at home yoga workouts a try! You may find that yoga changes your life! 10. Flip through old photos. Pull out pictures from a happy time like a family vacation or a girls weekend away and think about all the good conversation and laughs you had during those times. 11. Beautify yourself! Do your nails, spend some time putting on makeup, do your hair. You don’t need a special occasion to spend some time making yourself look and feel good! Have you ever gotten all dolled up and then put on your pj’s and watch a good movie? It’s amazing. Trust me! 12. Call a friend. Call someone who won’t give you advice or feedback. Call a close friend who will just listen. Sometimes all we need to do is just talk about something to feel better. No judgment or answers required. 13. Take a long, hot, luxurious shower! The steam will relax your body and mind. Then curl up with a good book and a cup of tea and relax. 14. Cuddle up with your pet. The action of snuggling and petting your animals is known to reduce stress and improve mood! Have you ever walked in the door and not seen your pet excited to see you? 15. Invite your family and friends over. Plan a gathering with the people you love most. Have a backyard BBQ, a game night or make a Sunday brunch. Time with others brings out the best in our mood.